Wrigley Roster Jenga: Stop Mocking Me! Maybe if our president watched an episode of Spongebob, he wouldn't be quite so sensitive. Ever since Alec Baldwin unleashed his Trump impression on Saturday Night Live during the election season, the Great Orange One has been on a crusade against the late night sketch show... much like he has been against the rest of the media. Of course, his Twitter tirades about how bad the show is, how mean the impressions are and all that mumbo jumbo is simply a reflection of the fact that the man can't handle criticism. SNL has skewered every president and presidential candidate since their beginning and only one has taken it as a deeply personal offense. This of course, only causes the writers to target him and his administration harder (of course, this crew offers up constant material). Perhaps you saw the Melissa McCarthy impersonation of Press Secretary Sean Spicer, last weekend? This bit absolutely stole the show on a night where the host accidentally unleashed an "f-bomb" on live television. Now, rumor has it that Trump's greatest enemy - that's right, Rosie O'Donnell - has offered her services to play assistant and Chief Strategist to the President, Steven Bannon. I think I can actually hear The Donald's blood boiling at the thought of it. Anyway, satire and parody have been around for as long as there have been politics and this administration is going to have to grow some thicker skin. 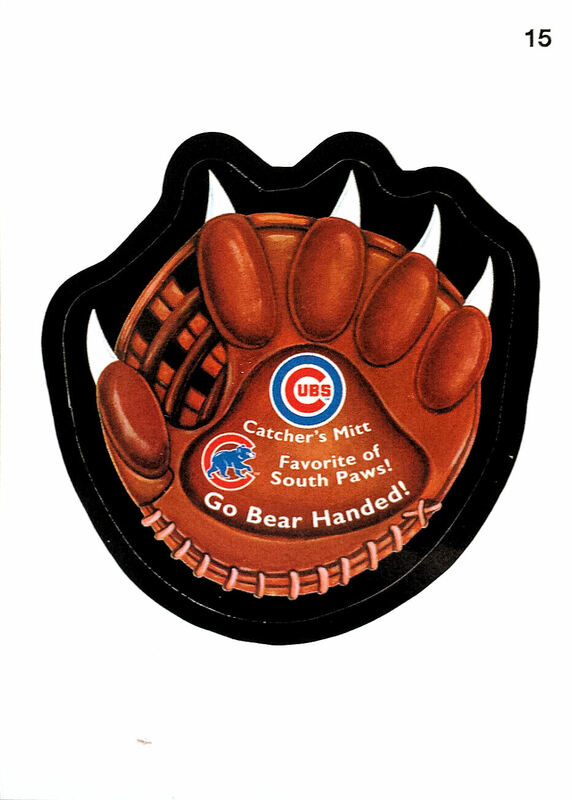 But, I know what you're thinking - "Tony, what does any of this have to do with baseball cards?" Well, believe it or not, I have a connection for you, the loyal reader. 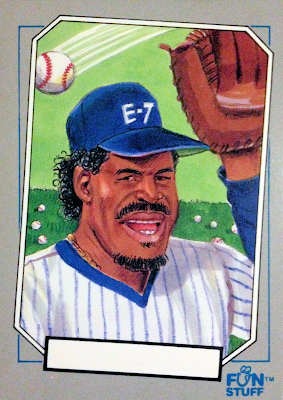 Coincidentally, Major League Baseball had a similar reaction to being mocked, circa 1991. Cardtoons was a set of art-based, parody cards which poked fun at Major League Baseball and it's personalities. 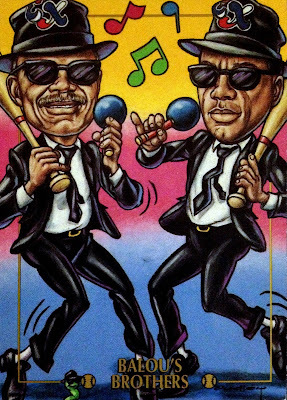 For instance, here we have the Balou's Brothers - a mashup of the Blues Brothers and the Alou family. At the time, Felipe was manager of the Expos at the same time that his son, Moises, patrolled the outfield. Sure, this reference would have made more sense with Felipe and his brothers Matty and Jesus, but that ship had long-since sailed. 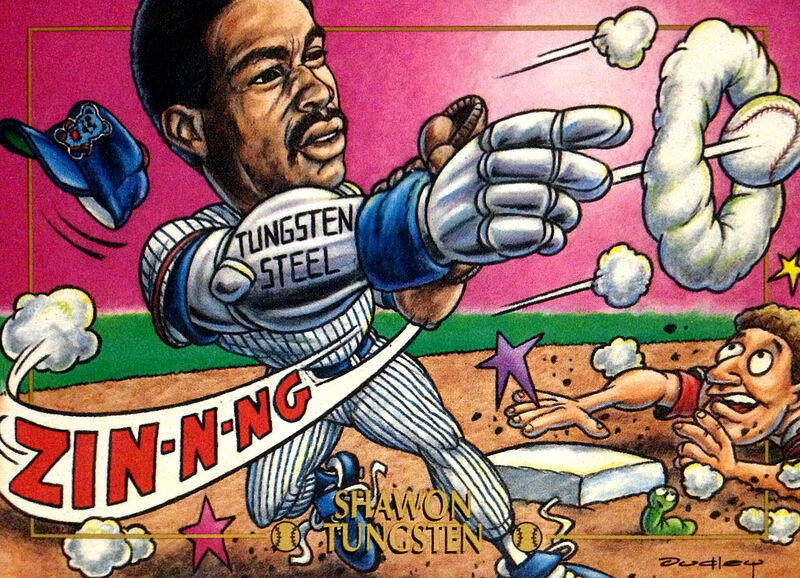 Shawon Tungsten bears more than a passing resemblance to Chicago shortstop Shawon Dunston, with his cannon of an arm that was about as accurate as the Bowling Green Massacre. This comedic set of baseball cards was supposed to hit the market in 1991, in the thick of the junk wax era, when everyone and their brother was making or marketing baseball cards. 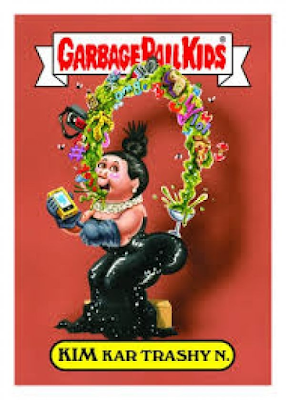 The people behind Cardtoons needed a niche and parody was their way to stand out from the crowd. By keeping using fake player and team names, they hoped the unlicensed set would avoid litigation, on the grounds that they were "expression protected by the First Amendment and therefore read a parody exception..." Well, the MLB Players Association would have none of that - according to them, the cutsie player names made the players easily identifiable. The set eventually got out in 1993, but the lawsuit that entailed stretched out for seven years, with Cardtoons eventually winning out. However, the lengthy court battle left the small company battered and, essentially, the MLBPA got what they wanted. Of course, they probably would have been okay with the whole thing if they got a slice of the proverbial pie. While all of that was going on, Confex put out their own parody set in 1992, called Baseball Enquirer. This set also lambasted current MLB players and on-field personnel, but left out the cute, slightly twisted names entirely, which is what I am assuming kept them safe from the MLBPA. Otherwise, I have no idea why they went after Cardtoons, but not Fun Stuff. The set wasn't very well-received and died a natural death after just one go 'round. In that checklist, was one implied "Cub" - George Bell. The longtime designated hitter proved why he filled that spot for the Blue Jays and the White Sox during his singular season in the National League. 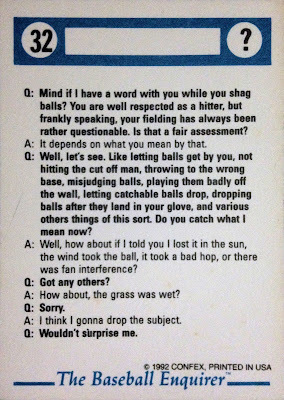 The backs of these cards featured comedic "interviews" with their unnamed subjects, thus earning their badge of "Baseball Enquirer." Some were actually quite chuckle-worthy, including the Bell above. 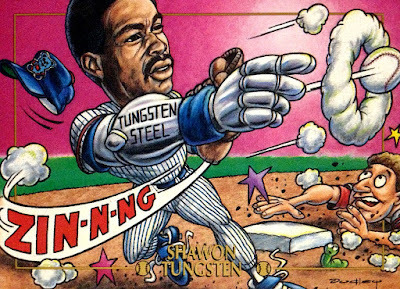 Others were notably mean-spirited, like the Lenny Dykstra look-a-like. 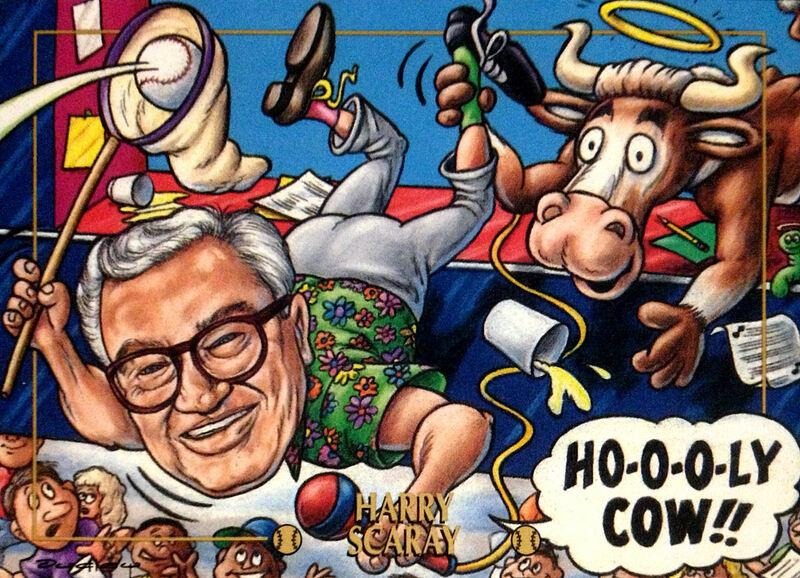 After Cardtoons was muscled out of business and Confex failed to grab a foothold in the lucrative market, the idea of a parody set featuring MLB personalities died for good. To my knowledge, to this date, no other similar undertaking has been attempted (with one exception), likely partially because the threat of litigation is not worth the cost of business. Furthermore, it's not like any of the licensed card manufacturers are going to stick their neck out on their own similar venture, especially not in the age of ultra-competitive exclusives. However, every now and then, satire and parody will rear it's head in a product. 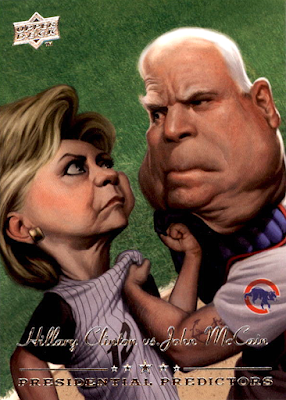 For instance, in the lead up to the 2008 presidential election, Upper Deck blended baseball with politics in their Presidential Predictors insert set. Without this checklist, we wouldn't have gems such as the one above, which compared the political dogfight with the infamous Michael Barrett vs. A.J. Pierzynski brawl. However, with Hillary Clinton being a noted Cubs fan, I think they should have flipped the roles here. 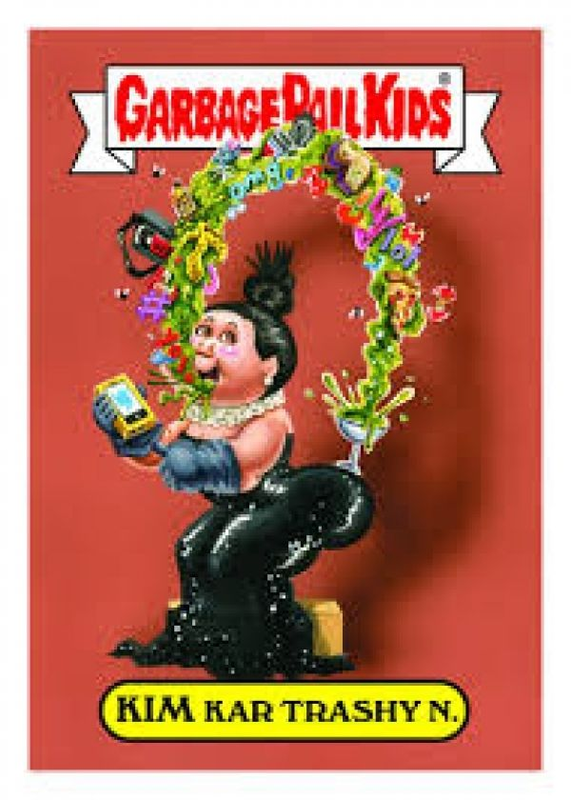 On the other hand, there seems to be no holds barred in the GPK world, which seems to have only gotten more pointed in the age of online exclusives. Their pop culture references run wild, like with my wife's new Kimmy K mocking above, and people get a real kick out of them. I have yet to find a baseball reference in one of these babies though. 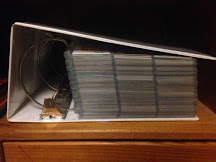 In summation, this was basically just a giant excuse to show off my Cardtoons and Confex parody cards. However, it was easy to draw some parallels between the MLBPA's stubborn refusal to see these mockeries hit the market and Donald Trump's inability to handle satire. I have to say, this quality is much more nerve-wracking and concerning to see in the leader of the free world than it is to see in a pro sports union that has no power over the direction of our country. At any rate, let's all remember how important it is to be able to laugh at yourself - "pobody's nerfect" and all that jazz. In the meantime, I'm looking forward to this Saturday night. After all, the comedy institution is only going to hammer him harder, from this point on. Maybe we'll even get that Rosie O'Donnell appearance that the internet is clamoring for. Cardtoons is...odd. So odd that I can't decide whether I love them or hate them. Though I do need to find a copy of that "Balou's Brothers" card now. Awesome job on this. I have a few Obama-related parody cards in my PC but there's no way to make a complete wantlist. Just have no idea what's been done. BTW...a Rosie O'Donnell sketch might may someone's orange head explode. That would be fun to watch. I enjoy the occasional break from base cards but I don't know that I could do a full set of this. The fun part is taking shots at the players weakness but that doesn't gain much support from mlbpa so double edged sword. I just have to say It's a good thing Donald wasn't in power back when the Royal Canadian Air Farce was on..
Of course, the difference between SNL and RCAF is they got everyone and periodically had the actual person on during a sketch they were being made fun of..
McCarthy nailed it! Funniest sketch I've seen in months. Your post is a good reminder not to take ourselves so seriously, or some of our elected and appointed officials for that matter. Apparently this applies to our collections too! Great post Tony! The New Baseball Cards are Here!